In response to communication from CAMERA, The New York Post has also corrected its Op-Ed to make clear that Airbnb's boycott does not extend to Jerusalem. See below for a detailed update. In Jerusalem, the situation is even more complex. The border dividing “Palestinian” East Jerusalem from “Israeli” West Jerusalem could leave some Israeli communities outside Airbnb. This includes the Old City’s Jewish Quarter, the City of David area, as well as the French Hill neighborhood and both Hebrew University campuses. Then there are mixed neighborhoods like Abu Tor, whose main road spans both parts of the city and is home to both Jews and Arabs. Will the Palestinian living on the Jewish side be allowed to continue renting out his home while his cousin down the street will not? Palestinian neighborhoods in East Jerusalem like Silwan, where Jewish settlers have increased their presence and at times even won legal ownership battles, pose a unique challenge of their own. But they also serve to highlight the futility of trying to use aggregated online data to solve political questions. Likewise, a subheadline in the digital edition erred: "Boycotting settlements might seem like a simple task, but drawing a distinction between Jewish and Palestinian communities in the West Bank and Jerusalem is much harder than it seems." 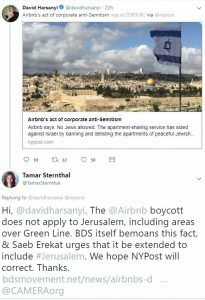 Airbnb's delisting applies only to Israeli settlements in the West Bank, where Palestinians have limited self rule under Israeli military occupation. It does not apply to Israel itself, or East Jerusalem and the Golan Heights, territories Israel has annexed without international recognition. Indeed, a BDS site bemoans the fact that the decision does not apply to Jerusalem. 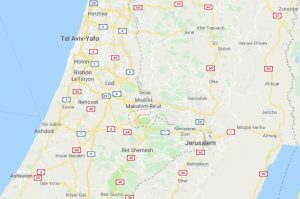 Using only Google Maps to define the border near Jerusalem makes the situation even more complex. Though Airbnb told Haaretz the ban will not affect East Jerusalem, it is unclear how this will work if Google Maps is employed, as the border it provides for dividing “Palestinian” East Jerusalem from “Israeli” West Jerusalem could in theory leave some Israeli communities outside Airbnb. This includes the Old City’s Jewish Quarter, the City of David area, as well as the French Hill neighborhood and both Hebrew University campuses, all inside the West Bank per Google's map service. After this article's publication, Airbnb told Haaretz they have a "framework" in place to deal with the settlement issue and stressed the ban does not include East Jerusalem. Airbnb did not provide further detail regarding this framework. Airbnb says an entire team “struggled to come up with the right approach.” And the right approach evidently was to bar Jews from listing the apartments and homes in the West Bank and East Jerusalem. CAMERA has contacted The Post to request a correction. Stay tuned for an update. 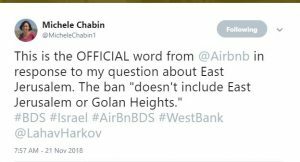 Clarification: Airbnb's delisting applies to the West Bank, but not East Jerusalem, as subsequent reporting has made clear.